March is a busy time of year in the Tokyo art scene. Art Fair Tokyo will once again fill the vast halls of Tokyo International Forum from March 22nd until 24th, while G-Tokyo, the curated, boutique-style art fair, will be held in Tokyo Midtown the same weekend. Roppongi Art Night 2013—a festival created in cooperation with a handful of art institutions, chambers of commerce and the Tokyo Metropolitan Government—will happen on Saturday night, March 23rd, with some programs extended over the whole weekend. 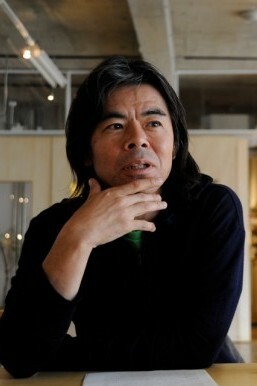 Katsuhiko Hibino has been overseeing all the artistic programs for this year’s Roppongi Art Night. Hibino is an artist associated with experimental drawing and painting. His 2010 exhibition, “Why Do People Draw Pictures?,” included many works on paper the artist created while traveling around the world. It included all kinds of mark-making, including the use of sand beneath his feet in Laos and the blood of a hunted seal in Canada. Hibino has also shown works in the Echigo-Tsumari Triennial, the Biennale of Sydney and the Venice Biennale. His paper latern boats, Tohoku Koyomi no Yobune, created with warm messages to the people of Tohoku, were a part 2012’s Roppongi Art Night before traveling to the Kasshigawa River in Iwate Prefecture. What vision will the artist bring to Roppongi Art Night 2013? As stated in the event’s press release, Hibino is arranging a few hands-on projects in which the director himself, plus a number of other local artists, will collaborate. The Art Boat Project will consist of a number of grounded ‘vessels’ traveling around the neighborhood. A lighthouse monument, also created by Hibino, is set to keep the crowds warm outside around the Roppongi Hills Arena with an open fire. The event’s subtitle, “TRIP－Witness today’s transformation into tomorrow,” promises a theme that includes multiple concepts surrounding time and space, centered around the progression of night into dawn. The annual event always provides more art than anyone can handle; among the possible exhibitions and events to take in, there will be Makoto Aida’s solo exhibition and a special screening of films by Chikako Yamashiro at Mori Art Museum (open all night until 6 a.m. on Saturday night), an interactive display for ‘adults with a playful side’ at Tokyo Midtown (open until 5:30 a.m.), “Kabuki: Theaters During the Edo Period” at Suntory (until midnight), PechaKucha events and exhibition at 21_21 Design Site (exhibition open until midnight), and “Artist File 2013” at the NACT (until 10 p.m.). Outside of the main buildings, Art Port Roppongi will be found in a number of surrounding shops and restaurants. Audiences can try their luck at exploring some streets and finding installation, moving image, sculpture or performance works along their path. With so many options, everyone’s experience of the festival is bound to be unique.